First Wind has wrapped up construction on the largest wind farm in Utah-the 203 MW Milford Wind Corridor project-which is coincidentally the largest wind power project the Boston-based company has ever taken on. The recently completed Milford Wind Corridor project was large in several respects: at 203 MW, it is the largest single wind power project that independent power company First Wind has ever undertaken-and it is the largest wind power project ever built in the state of Utah. It is also one of the largest renewable energy production facilities in the state. But there could be much more to come. First Wind plans to build up to 1,000 MW of wind power in this area of Utah over the next few years. Construction on the second phase, an additional 102 MW, is expected to start this year. Though construction started on the project in November 2008-and wrapped up in late 2009-Milford, like many wind power projects, had been years in gestation. First Wind started evaluating the site in 2003. The company had actually heard about the site from a local high school physics teacher, Andy Swapp, who has a farm in the area and knew first-hand about the strength of the wind resource. Swapp had taken some of his students out to the site and, equipped with hand-held anemometers, they confirmed just how strong the wind resource is at Milford. Dubbed "The Wind Kids," they erected met towers to further confirm the data. First Wind followed up with larger met towers, to get a more detailed read on the wind resource in the Milford Valley. And they discovered some interesting information. "The wind resource there is different and special because it tends to peak in the afternoon and in the summer," explains Peter Sullivan, Milford project manager for First Wind. 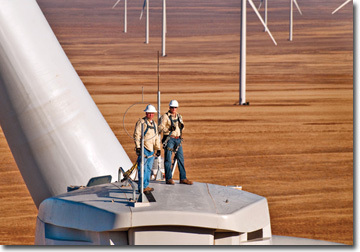 "A lot of other wind resources tend to peak at night and in the winter. From that perspective alone, the load matching qualities were very good-and that helped to attract power buyers like SCPPA to the project." SCPPA is the Southern California Public Power Authority. First Wind has a 20-year Power Purchase Agreement with SCPPA (on behalf of the Los Angeles Department of Water and Power and the cities of Burbank and Pasadena) to supply power from the Milford project. A unique aspect of Milford is that it was the first project permitted through the Bureau of Land Management's (BLM) relatively new programmatic Environmental Impact Statement (EIS) for wind power projects. The overall goal of the programmatic EIS is to determine the best approach for managing wind energy development on BLM-administered lands. Ideally, a comprehensive approach ensures that potential adverse impacts are minimized to the greatest extent possible, and that projects provide the greatest economic benefits to local communities and the region as a whole. "It essentially consists of a thick binder detailing what you plan to do, when you plan to do it, how you plan to do it, with details about the cultural and natural resources in the area, and a mitigation plan to minimize the project's impact," says Sullivan. "Every question you need to ask and answer about a project is in that document." While First Wind is responsible and careful with all of its wind power projects, Sullivan notes the BLM's approach is more systematic, and perhaps detailed. That's no surprise since-with the BLM-public lands are involved. "It's a different approach than if we were dealing with private landowners," he says. "That said, I think it has helped to make the project better. It's forced us to think through things, and the BLM to think through how they manage their land. It ended up being a very good process to go through, and one that we are continuing to go through with the BLM." The Bureau of Land Management, which falls under the U.S. Department of the Interior, is expected to be a major player as wind and solar power development goes forward in the U.S. To put it simply, the BLM has the land on which a whole lot of renewable projects are looking to locate. The BLM is responsible for managing resources on 253 million surface acres, as well as 700 million acres of subsurface mineral land. These public lands make up a staggering 13 percent of the total land surface of the United States and more than 40 percent of all land managed by the federal government. Most of the public lands are located in the Western U.S., where a great deal of wind and solar power development is expected to take place over the coming decade. "The BLM is going to play a huge role going forward," says Sullivan. He noted the BLM had a conference this past fall in Las Vegas to talk about the challenges they face with developers wanting to build renewable energy projects on public lands. "They really want to make this work, and that was the experience we had with BLM people on the ground with the Milford project. There is a desire to work with solar and wind developers to move things forward." One thing that helped move the Milford project along was the strong support the project received from the local Beaver and Millard counties, the state, and the private landowners involved (some of the project is located on private land). "That support was really important in getting the project approved and completed," says Sullivan. "The counties want the projects and all the economic benefits that come with the projects, and their support was very helpful for us." Compared to some of the states in the West-California, for example-Utah is fairly new to large scale development of wind power. But the state government has been quick to get on board and is very aware of the economic benefits projects such as Milford deliver. States such as California are looking outside to help meet their clean energy needs. In some states, it might be a sensitive issue if the power, as in the case of Milford, is being exported, rather than being used locally, or even in the state. "That issue does come up," says Sullivan. "People want to know why the power is being sent to California, why it's not being kept in Utah. It can be a tough conversation." But he also added that First Wind would like to sell wind power into Utah, and the company has had discussions with Utah Governor Gary Herbert's energy task force on the markets for wind power in Utah. "We are open and willing to consider that-we'd love to do some local power work." There's no doubt that Milford is a huge project for the lightly populated area of southwest Utah, which is fairly remote and has limited business activity. It's about 200 miles southwest of Salt Lake City. "We're talking about a $400 million project coming in to this area," notes Sullivan. As mentioned previously, in addition to the now-completed 203 MW, the company has plans for further wind power development. "We have the space for more," says Sullivan. 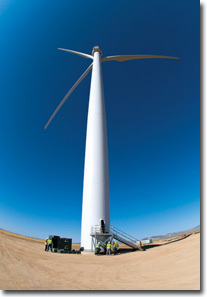 First Wind would like to start construction on phase two in the spring of 2010, an additional 102 MW with 68 turbines. But all of this would require a substantial chunk of land. First Wind has 16,000 acres for phase one, and the second phase would require another 8,000 acres. "If you extrapolate that, and say 8,000 acres per 100 megawatts of power, that would mean we'd need about 80,000 acres in total," says Sullivan. Some of that would be BLM land, and some would be private land. Milford is quite a distance from major population centers such as Salt Lake City and Provo. But a nearby Interstate and railway line helped facilitate getting materials to the site. "It's always a huge exercise getting all the elements together for a project," says Sullivan. "Milford was an easier build than a ridgeline build in Maine or Maui," says Sullivan. "But there is no such thing as an easy build. Every project has its challenges. "You could walk out to the Milford site, and see that it's all desert, and think building there would be easy. But there are cultural resources and natural habitats out there that we had to deal with, and we worked closely with the BLM on the plan of development. We did not go into this thinking it was going to be an easy build." They were careful not to disturb native animal species, such as burrowing owls. The site itself is fairly flat and relatively unpopulated. "There is lots of open land, but the biggest constraint you find-and this is similar with other states-is the lack of transmission," says Sullivan. In addition to installing 58 Clipper Liberty 2.5 MW wind turbines and 39 GE 1.5 MW wind turbines on the Milford project, First Wind had to build an 88 mile transmission line, and there were some environmental challenges there. "We intended to start the line from Milford, and start the other end of the line from Delta, and meet in the middle. We ended up having to divide up the construction of the transmission line because we had nesting raptors close to the location of the line, and we did not want to disturb their habitat." It's all part of being flexible with the construction plan, says Sullivan. "Animals are going to do what they are going to do-and we try to put together an adaptive management plan with the BLM that is mindful of that." The strong winds on the site itself meant that they sometimes had to stagger construction. As with all wind power projects, it is important to have a good, steady wind resource-but the trick can be the challenge of building the wind farm on such a windy site. Due to winds blowing later in the night, construction shifts sometimes started as early as 4 a.m., and special night lighting was required. Sullivan noted that all in, Milford actually involved five separate projects: the wind farm, the civil work, the power line, the substation, and the Operations and Maintenance building. "If you think of all those pieces going on at once, it gets pretty complicated, pretty quickly." 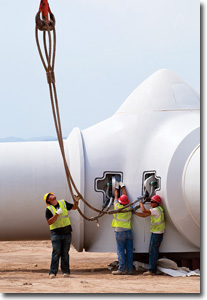 But the general contractor on the entire project, RMT Inc, is experienced at wind farm construction. "For all the complexities of the Milford project, they were able to get it done on time and on budget. That is what everybody shoots for on large projects like this-and the guys at RMT nailed it." The Milford project marks the largest project to date for First Wind. "This is a huge project for us not only because it is a 203 MW project, but also because it involved a lengthy transmission line, and all of this was in the middle of Utah." There's plenty of work ahead for First Wind. Besides the additional phases of the Milford project in Utah, the company is carrying out a 25.5 MW expansion of its existing 57 MW Stetson Wind project in Maine and has proposed a 200 MW project for the island of Molokai, in Hawaii. First Wind has proposed another Maine wind farm, the 60 MW Rollins Wind project, and a 40 MW project has also been proposed for Vermont. "We've got plenty to keep us busy," says Sullivan.